There are four parathyroid glands in our body. 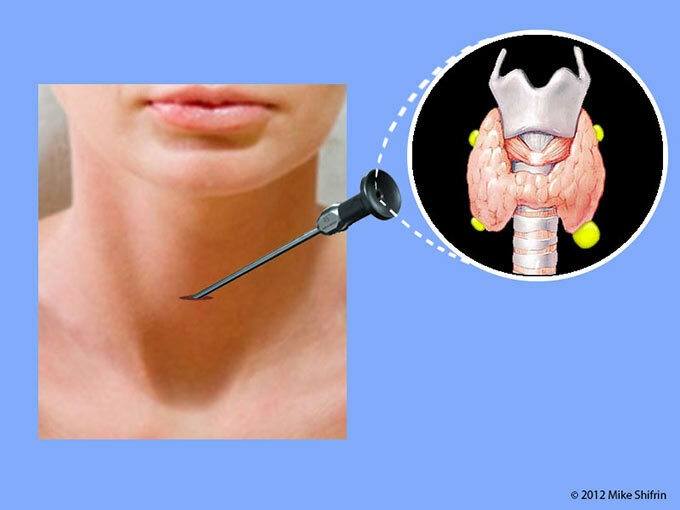 They are very small, about 1/ 5 of the inch and they are located on or behind the thyroid gland in the neck, or elsewhere around this area: usually two on the top and two on the bottom on each side of the neck. Parathyroid glands have sensors which detect amount of calcium in the bloodstream. They function normally to regulate calcium and phosphorus levels by secreting parathyroid hormone (PTH). PTH regulates the level of calcium in the blood, release of calcium from bone, absorption of calcium in the intestine, and excretion of calcium in the urine. When blood calcium levels falls, than parathyroid glands secrete PTH to stimulate calcium re-absorption from the kidneys and release it form the bone. Calcium plays an important role in bone development and in maintaining bone strength. Calcium is also important in nerve transmission and muscle contraction. Hyperparathyroidism is a disorder of the parathyroid glands, which resulted form hyperfunctioning, or excessive secretion of parathyroid hormone (PTH). Primary hyperparathyroidism is a disorder of one (in 85% of the patients) or more than one (in 15% of the patients) parathyroid glands. This problem originates in the parathyroid glands in opposite to secondary or tertiary hyperparathyroidism that cause parathyroids to be overactive secondary to such a problem as kidney failure. When parathyroid gland (or glands) becomes hyperfunctional and enlarged, it is ignoring our body needs and secretes too much parathyroid hormone (PTH) into the bloodstreem, causing calcium level to rise. Normal feedback mechanism that has to stop PTH overproduction is disrupted and one (or several) of the parathyroid glands loses their calcium sensor ability and starts functioning independently of the body needs. This condition of excessive accumulation of the calcium in the blood, called hypercalcemia. Primary Hyperparathyroidism is usually the result of parathyroid adenoma, a benign overactive tumor of the parathyroid gland. Enlargements of all four glands called hyperplasia. In 85 percent of people with primary hyperparathyroidism there is only one adenoma and in 15 % of people may have more than one adenoma or hyperplasia. Rarely, less than 1 % of people may have cancer of the parathyroid gland. This excess PTH release into the bloodstream may pole calcium out of the bones and cause osteopenia and then osteoporosis. Osteoporosis then may result in bone fractures. The levels of calcium may increase in the urine, causing kidney stones. PTH also lowers blood phosphorus levels by increasing excretion of phosphorus in the urine. Excess of calcium in the blood stream may also result in excessive deposition of the calcium in other part of our body, including vessels. 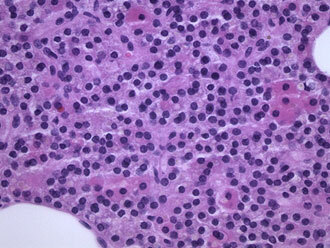 The vast majority of primary hyperparathyroidism is idiopathic. It means that we do not know the reason for that. Sometimes it is link to the exposure to radiation. In about 5 percent of cases can be linked to an inherited problem - syndromes. Familial multiple endocrine neoplasia type 1 (MEN 1) syndrome is a rare, inherited syndrome that affects the parathyroids as well as the pancreas and the pituitary gland. Familial multiple endocrine neoplasia type 2 A (MEN 2A) syndrome is also affect thyroid gland (medullary thyroid carcinoma) and adrenal gland (pheochromocytoma). It is important to rule out familial hypocalciuric hypercalcemia (FHH) syndrome because this syndrome does not required treatment. This is why it is important to be evaluated by specialist (endocrinologist or endocrine surgeon) who is familiar with this syndromes and can determine if further testing needs to be performed. In the United States, about 100,000 people develop the disorder each year. It is the third most prevalent endocrine disease, following diabetes mellitus and thyroid disorders. Women outnumber men two to one, and risk increases with age, occurring in 1/500 females and 1/2,000 males over the age of 40. In women 60 years and older, two out of 1,000 will develop hyperparathyroidism each year. A history of childhood irradiation to the face or neck is the risk factor for the development of primary hyperparathyroidism. Primary hyperparathyroidism is a more common disorder than previously documented. It is crucial to evaluate even mild hypercalcemia, because 43% of these patients have primary hyperparathyroidism. Primary hyperparathyroidism is underdiagnosed and undertreated. What are symptoms of primary hyperparathyroidism? Most commonly patient had no symptoms and she or he was found to have elevated blood calcium level on routine blood test. When symptoms do appear, they are often mild and nonspecific, such as a feeling of weakness, tiredness, fatigue, depression, memory problems, muscle aches and bone pains, constipation, frequent urinations, sleep disturbance, and anxiety. With more severe disease, increased calcium excretion in the urine may cause kidney stones. The most common complication of primary hyperparathyroidism is kidney stones, with an incidence of 15% to 20%. Other renal manifestations of primary hyperparathyroidism include hypercalciuria, which is seen in approximately 40% of affected patients. An unexplained reduction in creatinine clearance has also been regarded to be a potential renal complication of primary hyperparathyroidism Increased bone resorption will result in bone fractures in situations that it would not normally happen. A person may have a loss of appetite, nausea, vomiting, severe constipation, impaired thinking, memory and confusion. In more sever cases disease progress to the point of psychosis that would result in admission to the hospital and in the most extreme cases "hypercalcemic crisis" may develop and patient may become comatose. It has been recently reported that up to 30% of patients with Primary Hyperparathyroidism actually have significant symptoms of depression and one third of those 30% are reported to have suicidal ideas. Sleep impairment is prevalent in patients with primary hyperparathyroidism, with a reported incidence of 44 %. How to make a diagnosis of primary hyperparathyroidism? 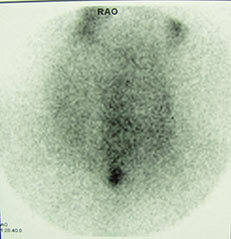 Hyperparathyroidism is diagnosed by checking blood calcium and PTH levels and findings that both of them are elevated. Other diseases can cause high blood calcium levels and have to be ruled out as well, but only hyperparathyroidism it is resulted in the elevated calcium and parathyroid hormone blood levels. When the PTH level is not above the upper normal limit, it tends to be in the upper range of normal, but in the setting of hypercalcemia, even such a normal value is not normal. Another variant of primary hyperparathyroidism has been described in which the total and ionized serum calcium are consistently normal, but in the PTH level is persistently elevated. This called normocalemic primary hyperparathyroidism. In order to diagnose normocalcemic primary hyperparathyroidism, all causes for a secondary hyperparathyroid state must be considered and excluded (for example vitamin D insufficiency). Once the diagnosis is established, other tests may be done to localize the disease, such as one gland versus several glands. Because high PTH levels can cause bone loss, a measurement of bone density can help assess bone loss and the risk of fractures. 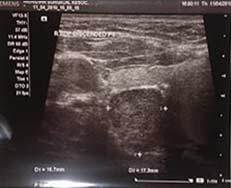 Abdominal ultrasound may reveal the presence of kidney stones, a 24-hour urine collection for calcium needs to be performed to rule out familial hypocalciuric hypercalcemia (FHH) and provide information on increased urinary calcium excretion by kidney. How is primary hyperparathyroidism being treated? The newest Guidelines "The Surgical Management of Asymptomatic Primary Hyperparathyroidism: Proceedings of the Fourth International Workshop." indicated that: all patients with Primary Hyperparathyroidism who meet surgical criteria should be referred to an experienced endocrine surgeon to discuss the risks, benefits, and potential complications of surgery. Patients who do not meet surgical criteria and in whom there are no medical contraindications to surgery may request a visit with an experienced endocrine surgeon. Alternatively, a multidisciplinary endocrine conference with surgeon involvement could be employed to address all relevant issues. 3) Imaging is not a diagnostic procedure; it is a localization procedure to help the surgeon optimize the operative plan. 4) The frequency of hereditary forms of Primary Hyperparathyroidism may be underappreciated and needs to be assessed with increased vigilance. And 5) surgery is likely to benefit patients due to high cure rates, low complication rates, and the likelihood of reversing skeletal manifestations. Past Guidelines for the Management of Asymptomatic Primary Hyperparathyroidism: Summary Statement from the Third International Workshop guided the use of diagnostics and management for this condition in clinical practice. The best treatment option for patient with Primary Hyperparathyroidism (those who meets surgical criteria) is minimally invasive parathyroidectomy. Your surgeon should have an expertise in parathyroid surgery and perform at least 50 to 100 parathyroidectomies per year to consider of being an expert. In order to perform a minimally invasive parathyroid surgery, surgeon will need a good parathyroid localization studies which include Sestamibi scan (and if possible Spect CT Sestamibi, which has much higher sensitivity than a Sestamibi alone) and designated neck/parathyroid ultrasound. Inraoperative PTH monitoring is the key to success. It helps surgeon to complete surgery for cure with intraoperative conformation of drop in PTH level to the normal ranges and more than 50% drop in PTH level from pre-excision to 10 minutes post-excision consider to be a surgical success (per Miami criteria by Dr Irving). All patients with biochemically confirmed primary hyperparathyroidism who have specific symptoms of their disease, such as kidney stones, fractures, or sever psychosis as the result of "hypercalcemic crisis" should undergo surgical treatment. Because surgery is always considered to be definitive therapy in this disease, even in asymptomatic subjects, a decision to elect medical monitoring should follow guidelines regarding severity of the manifestations of disease, and patients should be appropriately monitored. New data on the natural history of asymptomatic primary hyperparathyroidism have favored surgery because bone density does not appear to be indefinitely stable. Moreover, up to one third of patients who are monitored long term develop signs of disease progression. It has also been demonstrated that bone density increases consistently after parathyroidectomy in association with decreases in bone turnover. Serum calcium above at more than 1 mg/dl (>0.25 mmol/liter) above the upper limits of normal. Bone mineral density (by DXA) consistent with osteoporosis (T-score of less than –2.5 at the lumbar spine, femoral neck, total hip, or distal; 1/3 radius. In premenopausal women and in men younger than 50, the Z-score of –2.5 or less is recommended as the cut-point below which surgery is advised). Vertebral fractures by X-ray, CT MRI, or VFA. 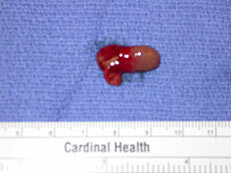 Surgery to remove the enlarged parathyroid gland (or glands) is curative it in 95 percent of patients. The best approach is to perform a minimally invasive parathyroidectomy. in order to have procedure as a minimally invasive surgery, good preoperative localization with parathyroid ultrasound and Sestamibi scan, as well as an intra-operative PTH monitoring are essential. Conservative medical therapy, such as use of calcimimetics (Sensipar), a new class of drug that "turns off" secretion of PTH, without lowing PTH level. This group of medications has been approved by the Food and Drug Administration only for the treatment of hyperparathyroidism secondary to kidney failure with dialysis (secondary hyperparathyroidism), and persistent primary hyperparathyroidism caused by parathyroid cancer that failed surgery or reoccurred as a metastatic disease . Some patients who have mild disease, do not have surgical indications and do not need immediate treatment, long-term monitoring is performed. Periodic monitoring would consist of clinical evaluation, measurement of serum calcium levels, PTH level, evaluation for presence of kidney stones, and bone mass measurement. If the patient or physician choose long-term follow-up, the patient should try to drink lots of water, get plenty of exercise, and avoid certain diuretics, such as the thiazides. Immobilization (inability to move) and gastrointestinal illness with vomiting or diarrhea can cause calcium levels to rise. Patients with hyperparathyroidism should seek medical attention if they find themselves immobilized, vomiting, or having diarrhea. After parathyroid surgery, serum and urinary calcium levels and the serum PTH level return to normal. After successful parathyroid surgery, increases in bone mineral density (decreasing the risk of fractures and improving of osteoporosis) are seen at the lumbar spine, hip regions, and, after some delay, at the distal one-third radius site as well. Bone mineral density increases after parathyroid surgery by approximately 10% to 12% at the lumbar spine and hip. Fracture-free survival is significantly improved with surgery compared with no surgery. Increases at the lumbar spine, hip, and distal radius are sustained over 10 to 15 years after surgery. Almost half of the postmenopausal women with hyperparathyroidism and low bone mineral density have a significant remineralization (bone recovery) response 1 year after parathyroidectomy. Those patients who gains the most bone mineral density recovery are younger, have more severe hyperparathyroidism and better renal function prior to surgery. In patients who underwent parathyroid surgery because of their renal stone disease, there were no recurrences of nephrolithiasis over a decade. Parathyroidectomy results in improvement of some neuropsychiatric parameters, such as cognition, mood, anxiety and memory. Recent data indicated that the recurrence rate after parathyroidectomy is between 2.1% and 2.5% regardless of the type of the surgery, either open parathyroidectomy or the minimally invasive parathyroidectomy. The percentage decrease in intraoperative PTH was protective against recurrence for both approaches. A higher postoperative PTH also independently predicted disease recurrence. Symptom improvement was most prominent 6 weeks post parathyroidectomy, although some symptoms showed continued improvement at 6 months. Fatigue and bone/joint pain demonstrated "Immediate Improvement" (>50% of patients reporting improvement by post-operative week 1), whereas the majority of symptoms showed peak improvement at 6 weeks ("Delayed Improvement"). Symptoms categorized as "Continuous Improvement" were those showing progressive improvement up to 6 months postoperatively (polydipsia, headaches, and nausea/vomiting). Surgery for hyperparathyroidism is highly successful with a low complication rate when performed by surgeons experienced with this condition. About 1 percent of patients undergoing surgery experience damage to the recurrent laryngeal nerve, which is controlling the vocal cords function, this can affect speech and result in hoarseness. One percent of patients loses all their parathyroid tissue and thus develops chronic low calcium levels (hypoparathyroidism), which may require treatment with multiple doses of the calcium with vitamin D a day. 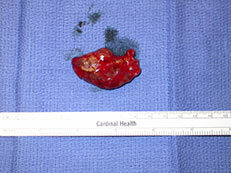 The complication rate is slightly higher for hyperplasia than it is for adenoma since more extensive surgery is needed. Rate of complications depend on surgeon experience in performing this procedures. What happens if parathyroid surgery is not preformed for primary hyperparathyroidism? Most of patients with mild, asymptomatic primary hyperparathyroidism who have been followed up for up to 15 years without surgery or specific medical therapy have stable calcium and PTH levels for the first 10 years. Serum calcium, however, does tend to increase slightly during years 10 to 15. For the first 10 years, bone mineral density is stable, but over the next 5 years, declines are seen at the hip and the one-third distal radius. Thirty-seven percent of patients followed up for up to 15 years met 1 or more indications for parathyroid surgery. Are parathyroid imaging studies needed before surgery? In order to perform minimally invasive parathyroid surgery, there are two most commonly used localization tests that are preformed prior to surgery to find parathyroid adenoma. 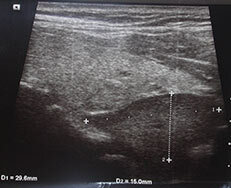 Those two tests are: neck parathyroid ultrasound and Sestamibi (parathyroid) scan. .
- There are three genetic syndromes that are associated with Familial Primary Hyperparathyroidism and resulted of specific gene mutations, such as the multiple endocrine neoplasia type 1 (MEN1), multiple endocrine neoplasia type 2A (MEN2A), and hyperparathyroidism-jaw tumor (HPT-JT) syndromes. Familial Primary Hyperparathyroidism has a younger age at diagnosis and an equally developed between affected men and women. Ann Surg. 2013 Nov 20. Predictors of Recurrence in Primary Hyperparathyroidism: An Analysis of 1386 Cases. Schneider DF, Mazeh H, Chen H, Sippel RS. Bandeira F, Griz L, Chaves N, Carvalho NC, Borges LM, Lazaretti-Castro M, Borba V, de Castro LC, Borges JL, Bilezikian J. Diagnosis and management of primary hyperparathyroidism--a scientific statement from the Department of Bone Metabolism, the Brazilian Society for Endocrinology and Metabolism. Arq Bras Endocrinol Metabol. 2013 Aug;57(6):406-24. Cipriani C, Romagnoli E, Cilli M, Piemonte S, Pepe J, Minisola S. Quality of life in patients with primary hyperparathyroidism. Expert Rev Pharmacoecon Outcomes Res. 2014 Feb;14(1):113-21. Press DM, Siperstein AE, Berber E, Shin JJ, Metzger R, Monteiro R, Mino J, Swagel W, Mitchell JC. The prevalence of undiagnosed and unrecognized primary hyperparathyroidism: a population-based analysis from the electronic medical record. Surgery. 2013 Dec;154(6):1232-7; discussion 1237-8. Murray SE, Pathak PR, Pontes DS, Schneider DF, Schaefer SC, Chen H, Sippel RS. Timing of symptom improvement after parathyroidectomy for primary hyperparathyroidism. Surgery. 2013 Dec;154(6):1463-9. Sitges-Serra A1, García L, Prieto R, Peña MJ, Nogués X, Sancho JJ. Effect of parathyroidectomy for primary hyperparathyroidism on bone mineral density in postmenopausal women. Br J Surg. 2010 Jul;97(7):1013-9.